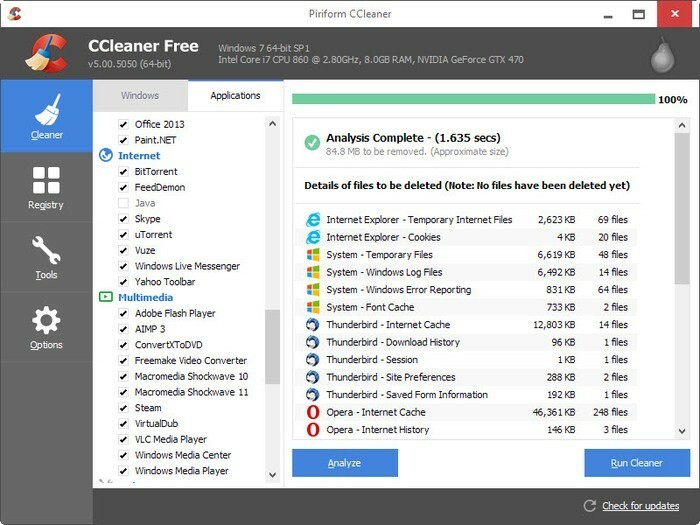 CCleaner is a small, effective utility for computers running Microsoft Windows that cleans out the ‘junk’ that accumulates over time: temporary files, broken shortcuts, and other problems. CCleaner has many abilities, but it can’t do everything. Here’s a list of what it can and can’t do. Protect your Web browsing privacy on a shared or public computer by deleting passwords and other temporary Internet files, so that nobody will be able to see where you’ve been. CCleaner Professional can also delete browser tracks every time you close your Internet browser – automatically or on demand. Protect your privacy for many Windows applications by removing information about files and folders you’ve accessed using them. Remove traces of documents you’ve already deleted by securely wiping free disk space. Clean up the Windows Registry by removing information that’s incorrect or no longer needed. Uninstall software easily – even when the Windows Control Panel Add/Remove Programs applet won’t let you. Manage your cookies – tiny files on your PC that Web sites use to track your visits. Find duplicate files – recover hard drive space and declutter your PC. CCleaner can’t detect or remove viruses, spyware, or malware. CCleaner can’t defragment your hard drive. CCleaner can’t recover deleted or corrupted files.